LA QUINTA, Calif. – Maverick McNealy played like a man on a mission. That mission Wednesday was to help the Stanford men’s golf team climb from 10th place after the opening round of The Prestige at PGA West into contention for its second straight win at the event. Stanford was seventh through two rounds of the three-day, 54-hole showdown. McNealy used nine birdies to post a remarkable 8-under 64 for his third medalist honor on the season. Editor's Note --- The 3rd win this season leaves Maverick only behind two Stanford players who have won more events in a season, Tiger Woods with 8 in 1995-96 and Patrick Rodgers with 6 last year. Only eight players in Stanford history have recorded a round lower than McNealy’s 64. With his victory, McNealy joins Tiger Woods (3 in 1994-95 & 8 in 1995-96), Patrick Rodgers (6 in 2013-14), Cameron Wilson (3 in 2013-14), Zack Miller (3 in 2006-07) and Joel Kribel (3 in 1996-97) as the only Stanford players to compile at least three victories in a season. See Stanford record holders. McNealy followed an opening-round birdie with a bogey on the second hole. He proceeded to birdie every other hole from four to 14, and then rattled off birdies on 15 and 16. McNealy (68-69-64) was 15-under overall. While the Cardinal briefly held the lead with a tournament-best 20-under 268, Arizona State used a late surge to take the tournament title. The Sun Devils were 31-under while Stanford (288-281-268) finished at 27-under. Stanford’s 20-under tied the best single round in program history. In 2006, the Cardinal rallied for a 20-under at the CordeValle Classic. It was the third straight top-10 finish for the Cardinal, which won The Prestige last season. Even more, McNealy was the program’s second straight medalist at the event, following the path blazed by Patrick Rodgers’ 2014 victory. McNealy was four shots better than second-place Xander Schauffele (San Diego State) and Jon Rahm (Arizona State), who both finished at 11-under. 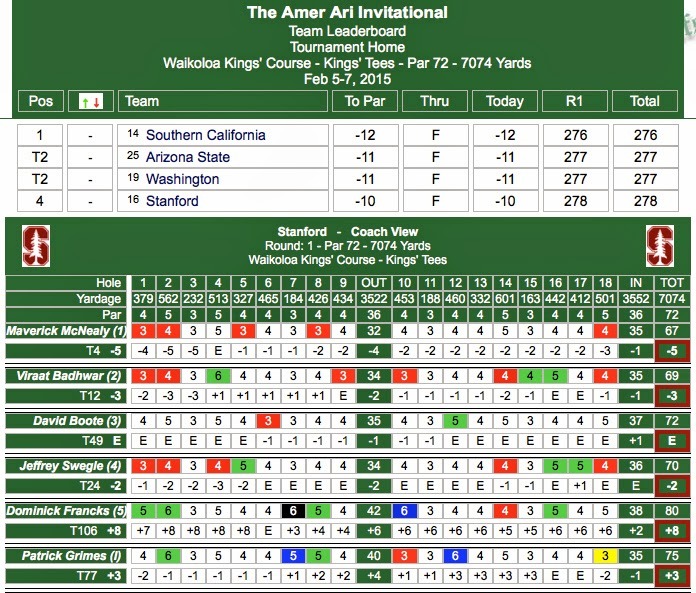 Including McNealy, four Cardinal finished its final rounds in the red. Viraat Badhwar tied for 19th and had a brilliant 6-under 66. Badhwar went 5-under on the front and was 6-under through 11. He neutralized a bogey on 12 with a birdie on the par-4 13th. David Boote, who tied for 27th, collected eight birdies with three bogeys for his 5-under performance. Franklin Huang tied for 21st following his 1-under finale and Jeffrey Swegle had an even-par kind of day. Individuals Patrick Grimes (t-56th), Dominick Francks (t-63rd) and Bradley Knox (t-77th) each went 2-over to conclude the event. 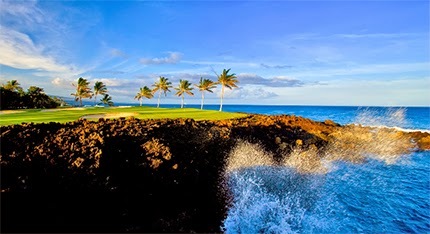 The Cardinal will now dust off its passports and head to the Querencia Cabo Collegiate (March 1-3) in San Jose del Cabo, Mexico. Stanford moved up three places to 7th with its 7-under par 281 team total, 16 strokes behind the leading USC team. The 7-under round was the 4th best of the day in which ASU was 14-under par and OSU was 13 under. Maverick McNealy is tied for 3rd overall, 1 stroke behind the two individual leaders after his 3-under 69 (68-69 137 T3). Freshman Franklin Huang fired a sparkling 68 (74-68 142 T20) in a round that included 4 birdies leading to a 32 on his back nine. Viraat Badhwar had another 73 (73-73 146 T42), David Boote bounced back with a 71 (76-71 147 T47) and freshman Jeff Swegle had a 77 (73-77 150 T59). Individual results included Patrick Grimes with 73 (76-73 149 T54), Dominick Francks (75-76 151 T63) and Bradley Knox came in with 80 (78-80 158 T77). Individual scorecards and top 7 team scoring is shown below --- click to enlarge. As in recent events Stanford finds itself with strokes to make up after round 1 as it sits in 10th place (out of 14 teams) after an even par day, 12 strokes behind the leader, Stirling University, from Scotland. Four Pac-12 teams are ahead of the Cardinal. Once again Maverick McNealy led the way with a 4-under 68 as he is tied for 4th place overall. He's followed by Viraat Badhwar and Jeff Swegle with 73s, Franklin Huang at 74 and David Boote with 76. Playing as individuals Dominick Francks had a 75, Patrick Grimes a 76 and Bradley Knox a 78. Scorecards are shown below in addition to the top 10 teams --- note team national rankings next to team names. Stanford slid into a tie for 10th with UCLA, 15 strokes behind ASU despite a 10-under par final round 278 total. Maverick McNealy once again led the way with a superb 2nd place finish individually, his 4th top 5 finish out of 6 events this season. Maverick's final round 65 included 7 birdies and an eagle 2 on the par 4 5th hole playing 296 yards where he drove to 15 feet - Maverick said afterwards that his eagle "got my round going". His 15-under total of 201 came on rounds of 67-69-65 as he finished two strokes behind Cheng-Tsung Pan of Washington. David Boote tied for 32nd on rounds of 72-70-69 211, Viraat Badhwar tied for 53rd with 69-72-74 215, Jeff Swegle was tied for 66th with 70-76-71 217 and Dominick Francks tied for 93rd at 227 on rounds of 80-74-73. Patrick Grimes played as an individual and tied for 76th at 220 total on rounds of 75-72-73. Final team and round 3 scorecards are shown below. Weather conditions were favorable for scoring in round 2 with light winds opening the door for low rounds. But Stanford was unable to make a move in round two, dropping from 4th to 8th place, as the top 7 teams all fired very low team totals ranging from 9 under par to 19 under par while Stanford was only 3-under on the day). The Pac 12 has 5 teams in the top 8 led by Washington at 30-under par and USC at 27 under par, while the Cardinal sits at 13 under par. Maverick McNeal again led the way in round 2 and is tied for 7th overall after a 3-under 69 (67-69 136 T7) followed by David Boote's 70 (72-70 142 T39), Viraat Badhwar's 72 (69-72 141 T24), Dominick Francks' 74 (80-74 154 T98) and Jeff Swegle's 76 (70-76 146 T66). Patrick Grimes had a 72 (75-72 147 T71) playing as an individual. Top team and individual scorecards are shown below --- click to enlarge. WAIKOLOA, Hawaii – Maverick McNealy led Stanford with a 5-under 67 at Waikoloa Kings’ Course as the men’s golf team started the spring portion of its season Thursday at the Amer Ari Invitational. McNealy, tied for fourth among individuals, had five birdies during his bogey-free round on the par-72, 7,074-yard layout. With a 10-under 278, the Cardinal is fourth among the 18-team field with two days remaining at the event, trailing USC (-12), Arizona State (-11) and Washington (-11). Viraat Badhwar worked around three bogeys with five birdies for a 3-under 69 to share 12th place. Jeffrey Swegle posted a 2-under 70 and David Boote checked in at even-par. Stanford placed four student-athletes in the top-50. Playing as an individual, Patrick Grimes’ 3-over 75 came with the squad’s lone eagle on the day. Grimes needed three shots to do the deed on the 501-yard, par-5 18th.